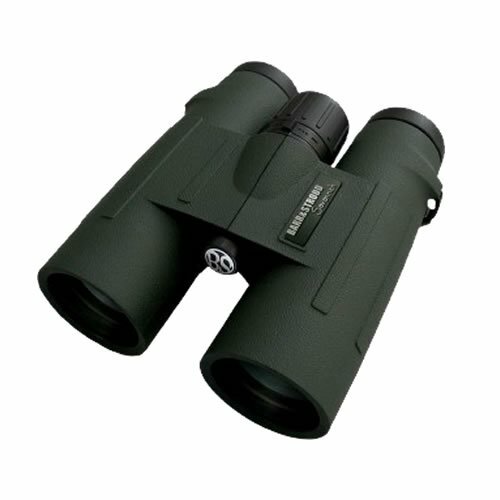 The Barr & Stroud Savannah 8x42 binoculars with their stunning wide angle performance is the optimum model in the range. At first glance of the specification details many people think that the apparent view of 143m at 1000m must be a misprint, it isn't, and the first time you look through the Savannah 8x42 eyepieces you will realise what an exceptional binocular this is. Combine this wide field of view with the large amount of light that is passed through to the user's eyes, with the combination of 8x magnification and 42mm objective lenses, and you have clear bright images in high resolution and colour fidelity that mark this model out as special. This combination is so important if the observer will be using the binoculars in low light conditions such as dawn and dusk when wildlife are on the move, or looking closely at a bird's plumage, to identify it's species, in dense foliage where the light is restricted. There is also the fact that 8x magnification is also relatively easy to hold steady without the need for additional support making the binoculars a joy to use. We don't expect that you will make a habit of dropping the binoculars into deep water but we do expect that you will want to use them in any weather the planet can throw at you, so you can feel assured that the Barr & Stroud Savannah can take it, again and again. This ability is further enhanced by the binoculars rubber armoured body which protects it from shocks and knocks. The binoculars are filled with nitrogen gas which keeps water out and also stops the optics suffering from internal fogging in adverse weather conditions, this binocular is truly weatherproof. Fully Multi Coated optics are standard features of the Barr & Stroud Savannah range as are BaK-4 phase coated prisms. This degree of sophistication ensures that as much light as possible is transmitted through the optics which results in super bright contrast rich images of high colour fidelity for the user even in low light conditions where less expensive optics and coatings result in a dramatic loss of performance. The Barr and Stroud Savannah 8x42 is supplied with carrying case, rain guards, tethered lens caps, deluxe strap and lens cleaning cloth.